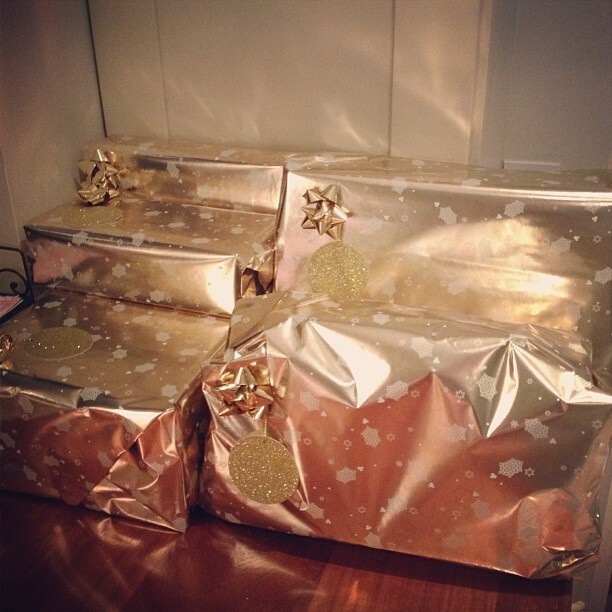 Blogmas Day 14: Wrapping It Up! Look at this happy girl! Her morning smiles just light up my day :) Here she is dressed head to toe in Next - one of my favourite clothing brands for kids! They really have the best quality stuff! 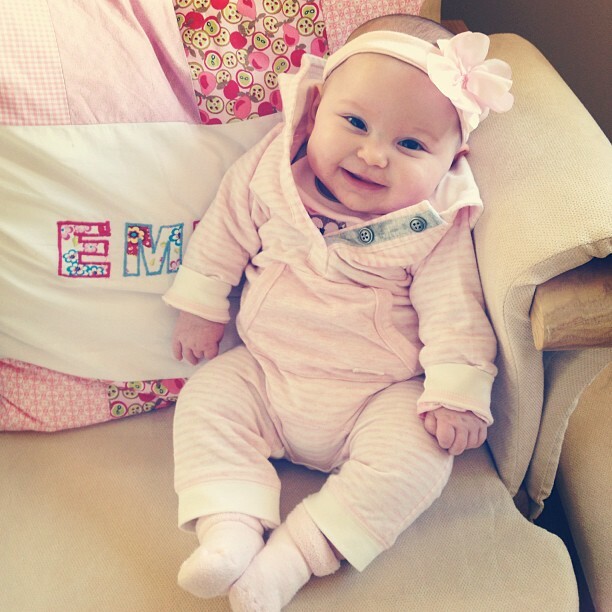 This baby-grow/hoody is super soft and she loves it because it keeps her nice & snug! We tried a little bit of a new routine today...which actually went quite well! I'm not sticking to it very rigidly but I did take a lot of tips from the Gina Ford book and am applying them to our own current "routine" (if you could call it that!) and daily life. Emilia napped from 12-2pm today in the car/stroller while we were running errands and it was very convenient for everybody! We FINALLY got to the post office and are done with the Christmas shopping for Jonathan's side of the family! A few of you have commented asking me to post more outfit pictures and I promise to do better at that! It's just that usually when I'm at my mirror (in our bedroom) I've got slippers on...ha ha ha! Then by the time we're ready to go I'm rushing out the door and I forget to snap a picture of the whole outfit. Anyway, here's a peek at what I was wearing on our daily walk today! 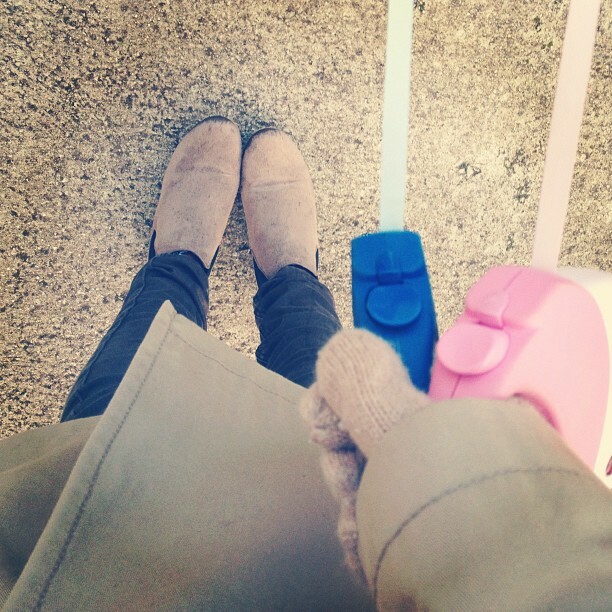 It's super cold so I'm wearing gloves, my trench coat (Sisley - about 5 years ago! ), scarf (not pictured) and Chelsea boots (LoveClothing). Tomorrow we are driving to Dublin for the first of our family Christmas parties, so here are all the presents wrapped up and ready to go! I got this paper in no other than good old Tesco...in case you're interested ;) This will be Emilia's first family Christmas party which is pretty exciting! I even have a festive dress picked out for her and I can't wait for you guys to see her in it! Every morning we have this little tradition after I get her dressed for the day (and snap her outfit pic!) when we go down to daddy's office where he's working and show off her outfit! It's so cute because it reminds me of how my dad used to admire all of our pretty clothes - the only difference is I think he was genuinely interested in fashion and things of that nature, whereas Jonathan probably just pretends for my sake...ha ha! Hope you are all having a fabulous Friday! You have a beautiful baby girl! Congrats. I never normally comment on anything but I have looked through your posts and am appalled by the negative, disgusting comments that people are leaving regarding you and your baby. This is bullying. This is why so many young people are ending their lives. I am so upset reading these spiteful comments. Fair enough that I might not agree with everything you do, just like you certainly would not agree with everything I do in my life! The fact is you are a good person. You are not out to hurt anyone or doing anything malicious or illegal. I cannot believe how strong you are to put up with these awful people making nasty judgements about you and your child. I have the utmost respect for you and your strength to be the bigger person. For all those haters, put your spare time into helping a charity not abusing and bullying this sweet girl and her family. I wanted to write a post like this a few days ago!can't believe how nasty and sick people are to leave their disgusting comments.they should get a life! !